(Iejima) “Henoko, Takae, and Iejima—the three are all one. Anger and frustration continue every day. Even after the passage of 71 years, we are still at war.” On November 22, Etsuko Jahana, 78, director of the Iejima Anti-war Peace Museum, made eye contact with visitors to the museum as she spoke passionately to them. Jahana’s talk was part of a tour planned by a Tokyo travel agency to learn about the history of Iejima. She spoke to twelve visitors from both Okinawa and other parts of Japan. 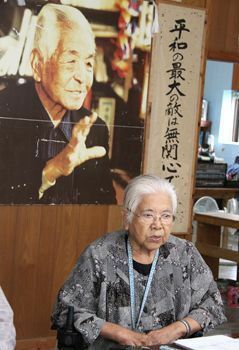 Jahana, who long participated in the peace movement with Shoko Ahagon, spoke about the helipad construction being carried out in the U.S. military’s Northern Training Area, which spans Higashi Village and Kunigami Village. “What is this situation, in which Okinawans are fighting with all their might? The central government has taken no responsibility since the Battle of Okinawa, and feels no remorse. It is so frustrating, I just want to ask, what on earth is going on?” Jahana criticized the government’s forceful pursuing of the helipad construction. In Iejima, the U.S. Marines’ MV-22 Osprey aircraft fly overhead, and noise issues are increasing. In 2015, the number of times that noise levels above 60 decibels were recorded near Iejima Auxiliary Airfield reached 2.5 times the 2013 figure. Jahana expressed concern that the Osprey will fly from Iejima to Takae and Henoko and threaten the livelihoods of Yambaru residents. “Okinawans alone can’t bring about peace. All Japanese people are responsible for whether we can overcome the current situation. I want people on the Japanese mainland to be aware,” she said.